The noisy crochet consists of an oscillator, a battery and an interface crocheted with regular and conductive yarn. 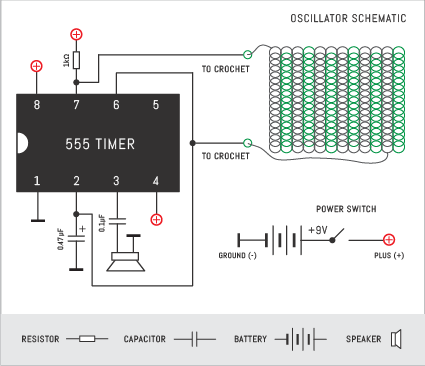 The oscillator produces a sound, which changes in its frequency depending on electrical resistance. This property is utilized in the crocheted interface – stretching or squeezing the part containing conductive yarn alters resistance. Low resistance results in high tones, while high resistance produces lower tones. To see it in action, have a look at the documentation of the noisy crochet workshop. On the right is a schematic for the oscillator, which produces the sound for the noisy crochet. You can implement it in different ways depending on what kind of shape and interface you wish to have. One way to construct it is to solder the circuit on a small perfboard, which you can later sew to your crochet piece(s). Leave long wires to the connections that will be attached to the crochet sensor, so you have the option to make them in desired length once your crochet parts are ready. The schematic instructs to use a capacitor of 0.47µF, but you can experiment with different capacitor values in order to see how the sound pitch changes. Capacitors with higher capacitance produce lower tones, and smaller capacitance results in higher tones, as the capacitor charges and discharges quicker. When using polarized capacitors, make sure that you connect the negative side to ground! Remember to also test that your oscillator works before mounting it to you crochet piece(s). Attach the battery and connect the two wires which will be later attached to the crocheted sensor – you should already hear a sound – if not, check your circuit board and use a multimeter for troubleshooting. There are many audio circuits which you can use for making something similar to noisy crochet. The one that we have used here is based on circuits like Drawdio and the noise maker by Bare Conductive. Use a rather large crochet hook (6mm or bigger) for crocheting the sensor part, as the idea is to have a loose, stretchy texture. You will need both regular yarn and conductive yarn. The regular yarn can be medium thick, stretchy wool – see how the yarn is spun, as yarns with many fibers twisted around each other stretch more. For the conductive yarn, use one that has a relatively high electrical resistance. Your crochet sensor will be based on changing resistance, so it is good to have a wide range within which you can play around. You have many shape options for making your sensor. It is possible to make different kinds of flat or 3D shapes with just few crochet stitches. For example, you can use the single crochet stitch to make a flat piece such as a rectangle. By increasing stitches you can make the shape wider, while decreasing stitches makes it more narrow. Alternatively, you can make a stretchy i-cord. Leave a long strand of conductive yarn in the beginning and end of your piece, as you will need to connect the piece to the oscillator with these. It makes also sense not to cut the conductive yarn until you have tested that your piece works as desired. Do not cut the conductive yarn at any point while crocheting it – you need to have one continuous piece of yarn going through the piece to ensure flow of electricity! In case you are making a rectangular or other flat shape (and not an i-cord), do not crochet the conductive yarn on every row, but on every third row or so, as this way you will have more resistance and a clearer effect on the sound. Just drop the conductive yarn in the end of a row, continue crocheting with the regular yarn, and pick the conductive yarn again when you return to the side where you left the conductive yarn. In addition to the stretchable/squeezable sensor piece, you can make additional parts for attaching the electronics and a small battery pocket. Crochet these in any shape you like using only regular yarn. You can attach the different crochet parts together with for example the single crochet stitch. You can mount the oscillator board on the crocheted parts which do not contain conductive yarn by sewing it with regular, thin yarn. Find also a comfortable place for the battery, so that you can still turn your noisy crochet on/off by opening and closing the battery clip. When mounting the board and the battery, make also sure that you can easily connect the conductive yarn ends in your crocheted sensor to the oscillator. Make some testing before making permanent connections – this way you can still change things. Connect each of the conductive yarn ends with crocodile clips to the oscillator, and check that all the connections are firm. Stretch/squeeze your crochet piece and see if the sound pitch changes. If it does not change enough in your opinion, just crochet more conductive yarn in your interface piece, as this will increase the resistance further. Once you are happy with the sound effects of your crochet sensor, attach the conductive yarns coming out of your sensor piece to the oscillator (so the beginning and the end of the yarn). You can first cut the connection wires on you oscillator board to a suitable length and solder small loops of metal wire in each wire end. Such loops make it easier for you to connect the conductive yarn to the oscillator. Use conductive yarn for sewing the connections – make sure that you have enough conductive yarn and tight connections. Your noisy crochet should now be ready and playable!